CAREER: Prospect was the first Trinidadian to attend the Royal Military School of Music at Knellar, England. 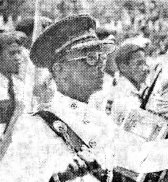 He pursued a bandmaster's course, graduated as the best conductor in his class, and then became the first Trinidadian musical director of the Police Band in 1964. He made an immediate impact at the 1964 Independence Day Parade when he broke with tradition and adapted Lord Kitchener's winning Road March calypso "Mama Dis Is Mas" to the military march. Prospect began a long relationship with the steelbands of Trinidad when he formed the first steelband in the police force. He composed the test pieces for Steelband Music Festivals in 1966 (Intermezzo in Eb) and 1972 (Maracas Bay). He wrote the score for the film "The Right and the Wrong" and included steelband music. In 1978, he produced an album for the Renegades Steelband after touring South America with the band. In 1981, he was the musical director and conductor of the Desperadoes Steelband in its tour of England. In addition to conducting, he arranged the music for the Casablanca Steelband at the 1980 and 1982 Music Festivals with "Zampa Overture" (2nd Place) and "1812 Overture" (1st Place), respectively. He retired as the Police bandmaster in 1982 but continued to compose many pieces of music for the steelband. During the 1990s, he did the musical notations for Panoramas and Music Festivals as the steelband consultant to the Inter-Cultural Music Institute, a joint venture of the University of the West Indies and the United National Development Programme. DIED: May 3, 2000, in Miami, Florida, USA, from heart failure.